Strackr collects all your affiliate data, such as transactions, revenue, clicks and payments, allowing you to more easily view your statistics. Save hours of time each month, and grow your business with Strackr! All your data in one place - no more logging in to each network multiple times a day. 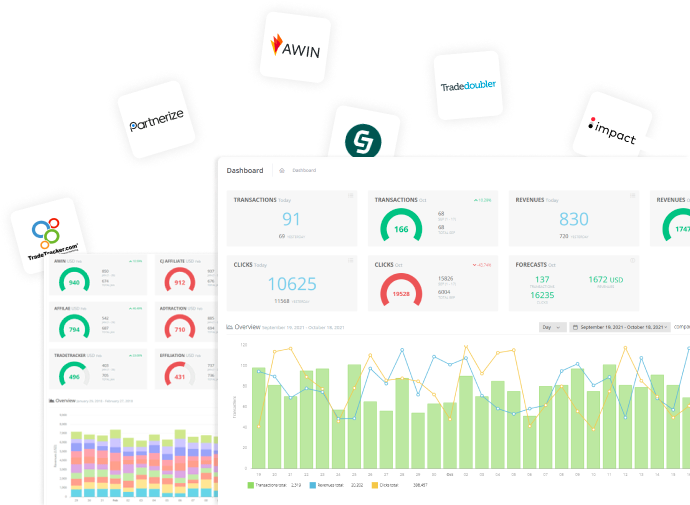 Access to your metrics from all affiliate platforms on one affiliate dashboard. Transactions, revenues, clicks and payments - all the reports you need, with advanced filters, global view or by website. Compare programs’ performance, and find the best affiliate programs. We take security very seriously; all your connection data are encrypted and hashed. You’ll have access to reports which will allow you to see transaction details: user device, OS, referrer clicks, landing pages and time from click to order confirmation. Depending on the program, you can view the basket details: product name, prices, rates and your earnings. Our metrics will help you follow your performance and increase your revenue. For each program, you will be able to compare your Revshare (your commission), CR (Conversion Rate) and your EPC (Earnings Per Click). This makes it easier to choose which programs to promote. It’s often difficult to check the transaction status for each program. With Strackr, you can choose your date ranges to check for issues! If you’re building an application like comparison engine or a cashback website, you may face challenges to support all affiliate networks due to various authentication methods and data models. Strackr unifie all data in one API making it easier for developers to integrate APIs from multiple affiliate providers into your applications. All you need to build your application with only one API integration ! You are a publisher and you want to share coupons to your readers, with our Deals feature you will save time and energy by finding in one place all the coupons (voucher codes) and promotions (offers) updated every days ! Deals are also available in the API. You’ll have access to the largest affiliate networks. We are happy to integrate additional networks, please sign up and contact us. No payment information required on sign up. Trial ends automatically. Transactions, revenues, clicks and payments statistics. Statistics by networks and programs. Programs status (joined, rejected, closed, suspended, closed). Yes, of course. All data is owned by you and can be deleted on your request. Yes, your plan can be changed at any time in the settings. The plan will be adjusted for next payment period. We accept credit cards (Visa, MasterCard, American Express).